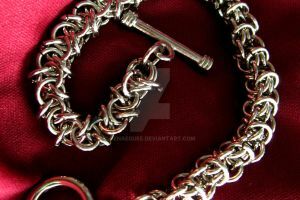 Finally got some decent pics of my Interwoven European 4-1 bracelet. 2.4mm 316L SS wire, about 12mm ID. It's wrapped around ~MrsPeregrinTook's Canon EF 28-135 f3.5-5.6 IS USM SLR lens because it was the only object I could find that was roughly the same diameter as my forearm.